Is Terro Ant Killer Poisonous? 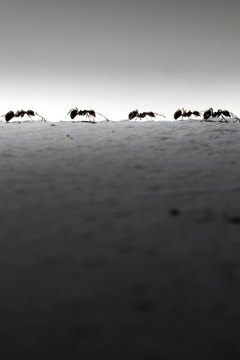 If you have an ant infestation in your home Terro products can bait and kill the ants. Although it is best to keep your pets away from the ant kill, the ingredients in Terro have a low toxicity and are unlikely to harm your pet. Borax, a natural mineral, is the active ingredient in Terro ant killer. It is also commonly found in other household items including hand soap, laundry boosters, mouthwash and toothpaste. Although it is not generally toxic to humans or pets, borax disrupts the ant's digestive system and slowly kills them. Although Terro has a low toxicity risk, some pets may have a reaction to the ant killer. Some potential signs of poisoning include vomiting, excessive drooling, pale gums and lethargy. Pets rarely experience symptoms from ingesting Terro and symptoms that do appear are usually mild. Veterinary treatment is not usually required. However, if your pet shows signs of a reaction or ingests more than 1 to 2 ounces, consult a veterinarian. Terro does not cause skin irritation, but may cause eye irritation if it splashes into your pet's eyes. A greater danger for your pet may be the plastic container holding the liquid Terro. Your pet may chew the plastic creating sharp shards that may cut his mouth, gums and throat if swallowed or choke on the container. If your pet eats the plastic container, he may experience vomiting or diarrhea. If you observe signs of choking such as gasping, blue gums, pawing at the face or if your pet loses consciousness, contact your veterinarian immediately. Do not induce vomiting, as the shards may inflict additional damage. Your vet may take X-rays or perform an ultrasound or CT scan to determine the best course of treatment. The plastic may be removed under sedation or may require surgery. Read and follow the instructions for using Terro ant killer and ant bait. Your pet will likely be attracted to the sweet liquid of Terro. While you must place Terro ant killer near the ant trail, keep it out of reach of your pet. Consider placing it inside of cabinets or under counters that your pets cannot access. Alternatively, close doors to keep your pet out of rooms containing ant killer until the ant colony is removed. Terro advises that this may take up to 10 days.